TELLS STORIES BETWEEN SLAPSTICK AND SUSPENSE. The exhibition was composed on the occasion of director Lex ter Braak’s farewell of the Van Eyck and opened on the day of his farewell celebration, 28 June 2018. The soft, but movable full-size portrait of Lex ter Braak was created for this occasion and resided at the Van Eyck after the directors departure. Confronting visitors with the actions of Moira, the three sisters Clotho (spinner), Lachesis (allotter) and Atropos (unturnable), the white-robed incarnations of destiny. Read the full exhibition text by Sascia Vos here. Read the full exhibition text by Loes Diephuis here. Commission to comment on an artwork via photoshop, questioning if and if yes, how sustainable art in public space is. Three-dimensional comic-story, including a raining cloud, a blown out fireplace, seventeen dead doves and a soon to be broken glass of Whiskey. Read the full exhibition text by Dr. Johanna Pahnke here. 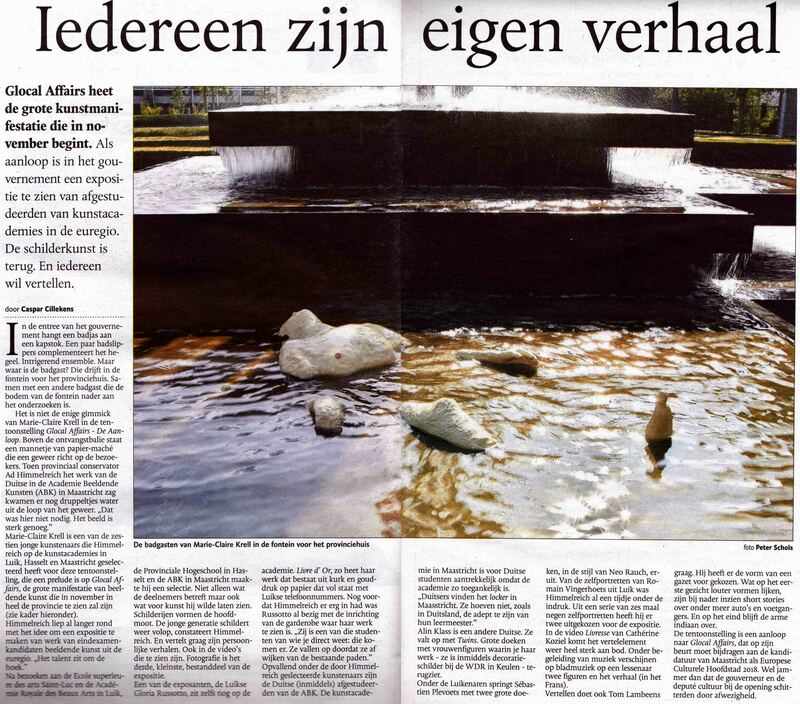 Find the article in De Limburger here. A three-dimensional comic-world, that evokes stories within the observing visitors, through life-sized sculptures and interactive installations. Read the full exhibition text by Ad Himmelreich here. Find the publication for the Gilbert-De-Bontridder-Prize here. A life-sized self-portrait hiding in plain sight. Rise and decline of the highest peakes in the European landscape. "We would like to know if you are happy to participate in a project. We had the idea of organizing a small expo in connection to the pop up event that can highlights the young talent. The idea consists in giving to you (artists) the same support (10*15) which is up to you to use as support for creating a little artwork. Which you can signed too. We’ll exhibit all the artworks received and sell it to the public. As you might know it is a charity event, thus, the 50% goes to charity and the other 50% goes back to the artists." Documentation, collection and presentation of the remains of my former housemates - artists, musicians and designers - which have been left behind throughout the house.